John F. Kennedy died almost half a century ago, yet because of his extraordinary promise and untimely death, his star still resonates strongly. On the anniversary of his assassination, celebrated political scientist and analyst Larry J. Sabato-himself a teenager in the early 1960s and inspired by JFK and his presidency-explores the fascinating and powerful influence he has had over five decades on the media, the general public, and, especially, on each of his nine presidential successors. 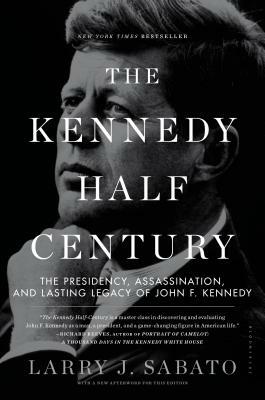 The Kennedy Half-Century reexamines JFK's assassination using heretofore unseen information to which he has had unique access, then documents the extraordinary effect the assassination has had on Americans of every modern generation through the most extensive survey ever undertaken on the public's view of a historical figure. The full and fascinating results, gathered by the accomplished pollsters Peter Hart and Geoff Garin, paint a compelling portrait of the country a half-century after the epochal killing. Just as significant, Sabato shows how JFK's presidency has strongly influenced the policies and decisions-often in surprising ways-of every president since. Among the hundreds of books devoted to JFK, The Kennedy Half-Century stands apart for its rich insight and original perspective. Anyone who reads it will appreciate in new ways the profound impact JFK's short presidency has had on our national psyche. Larry J. Sabato is the founder and director of the renowned Center for Politics at the University of Virginia. He has appeared on dozens of national television and radio programs, including 60 Minutes, Today, Hardball, and Nightline. He has coanchored the BBC's coverage of U.S. presidential returns and inaugurations, and has authored or edited more than a dozen books on American politics, including the highly praised A More Perfect Constitution-Why the Constitution Must Be Revised: Ideas to Inspire a New Generation. His other books include Feeding Frenzy, about press coverage of politicians; The Rise of Political Consultants; and Barack Obama and the New America. Sabato runs the acclaimed Crystal Ball website, which has the most comprehensive and accurate record of election analysis in the country. In 2001, the University of Virginia gave him its highest honor, the Thomas Jefferson Award. He lives in Charlottesville, Virginia.